RUSH: Now, normally this next story would not, I mean, I wouldn’t put it anywhere near the top of the Stack. But as I read this there was something that stuck out at me. It’s a Reuters story. “Trump Open to Dropping Health Care Provision in Senate Tax Bill,” and there’s a companion story that goes with this. Now, the reason this struck out at me, this doesn’t seem to be the kind of Art of Deal negotiating that I associate with Trump. Why tell ’em in advance what you’ll settle for? I mean, this is a big deal. You know, the House didn’t want to put it in there for whatever reason. But if you can gut Obamacare by gutting the individual mandate, you can gut so much of Obamacare. And the Senate’s tax bill has it in there. And Trump is open to dropping it if it means getting the tax bill passed. I don’t have a problem with that, but why tell people you’re willing to give up on something before you even start? If this is true. Look, it’s a Reuters story. I know the Mulvaney quote would be tough to manufacture, but there’s another nameless White House aide provided here as a source. 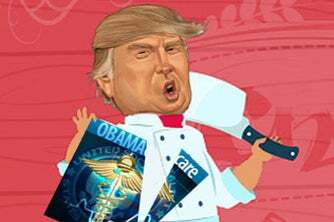 The story says: “It was too soon to say whether eliminating the repeal of the so-called individual mandate –” What do you mean, so-called individual mandate? There’s nothing so-called about it. It is an individual mandate. “It was too soon to say whether eliminating the repeal of the so-called –” There’s nothing so-called about it. It is the individual mandate. “It was too soon to say whether eliminating the repeal of the so-called individual mandate would increase the bill’s chances of passing. The provision was not an impediment now, Mulvaney said.” Well, why bring it up? If it’s not a problem, why are they bringing it up? I’m just confused. And then this next story from an all of a sudden very worried New York Times. Wait ’til you hear some of the numbers in this story. “Middle-Class Families Confront Soaring Health Insurance Costs.” Let me read you the first paragraph and then tell you what this story’s purpose is. Are you ready? Here we go. Now, this is screwy. Thirty thousand a year for health insurance for a family of four where the parents are in their thirties? Which means they’re either Millennials or just slightly older than Millennials, $30,000 for health care insurance? This family probably won’t come close to spending $30,000 on its actual health care in a year, and yet the insurance is 30,000 dollars? And you can imagine what the deductibles are here. The deductibles so sky-high that you never even reach them. So what in the world is this? Thirty thousand a year for health insurance when if you had none — what is this family gonna spend on health care, what’s the statistical average of mom-and-pop and 2.8 kids relatively, you know, middle class healthy? I guarantee you outside of catastrophes, they’re not gonna be spending 30 grand on medical costs. “Yeah, yeah, ’cause I can’t afford it.” And that’s the design. That’s what was supposed to happen. Thirty thousand for healthy people. It’s an illustration again of what the purpose here is. Soak the young in order to fund for huge expenses incurred by seasoned citizens. But this family doesn’t have 30 grand sitting around not being used that they can buy health insurance with it. Now, here’s what the purpose of this story is. This article is intended to convince the Senate not to do away with the Obamacare mandate! That’s what this is. The New York Times and the American left do not want Obamacare gutted. Therefore, they don’t want the individual mandate gutted, because the individual mandate is Obamacare. Requiring citizens to buy this product, thanks to John Roberts and the Supreme Court calling it a tax, means that everybody has to buy it under penalty of law, penalty of punishment if you don’t. The mandate then maintains the subsidies, you see. So the New York Times doesn’t want the mandate to go away, and this story is intended to have U.S. senators read it, or their staff in the case of Senator Feinstein and Senator Franken who probably don’t read the stuff anyway, report to them from their staff, it’s what they know. But, anyway, it’s supposed to convince the Senate, this is outrageous. We can’t get rid of the mandate because then that would get rid of the subsidies and we need subsidies because people can’t afford 30 grand. So, you see, the New York Times is telling us that all of this, the $30,000 premium for that family of four, it’s all Trump’s fault. Things were so much better under Obama! When the premiums are about $200 less. Instead of $38,000, it was $29,800. So much better under Obama. She might have a point about sabotage, but not the way she means it. The sabotage was baked into Obamacare. The sabotage is of the private insurance and health treatment industries. Skyrocketing premiums were part of the plan. The idea was eventually people would throw up their hands and demand Medicare for all or single payer for all ’cause 30 grand, are you kidding me? Again, that’s not even the amount of money this family’s gonna spend on health care, whether they’ve got insurance or not, barring a catastrophe. And of course that’s whole point here, catastrophic insurance and not much else. This is absurd. The best deal they could find? He-he-he-he-he. And this woman thinks Trump is sabotaging things? It just goes to show you. “Obamacare was gonna be free. Obamacare was gonna be great, wonderful, ’cause Obama was a smart person, Obama was a good person, Obama cared. Obama wasn’t coarse, Obama didn’t tweet all the time, Obama didn’t embarrass me. I loved Obama. Obama was just wonderful. Michelle was even better. I loved them both. And now Trump’s come along, and he’s messing everything up for me.” That’s courtesy of the American media trying to convince people that this debacle is somehow owing to Trump when of course Trump’s got nothing to do with it. RUSH: By the way, folks, there’s another family example given in this New York Times story. Wait ’til you hear this. “The Dixon family, which includes two girls ages 1 and 3, has been paying $988 a month this year for insurance provided by Anthem Blue Cross and Blue Shield. But Anthem plans will not be available in Charlottesville next year.” They are abandoning Obamacare. “The company told customers that uncertainty in the insurance market ‘does not provide the clarity and confidence we need to offer affordable coverage to our members. '” In other words, this market’s so out of whack that we can’t charge you what you can afford. It would be silly for us to be in this market because what we would have to charge you would be ridiculous. Nobody would buy it. We’re leaving. So the family goes to HealthCare.gov to find a replacement. And HealthCare.gov recommended another plan for Mr. Dixon next year. The new plan is offered by Optima health. And the premiums — are you ready? Dadelut dadelut dadelut. Remember, they’re now paying $988 a month under Blue Cross, gonna get canceled. The recommended plan from Obamacare’s website for 2018, $3,158 a month, which comes to $37,900 a year and an annual deductible of $9,200. So this family, the Dixon family in the New York Times story, the purpose of which is to try to force senators not to include removing the Obamacare mandate in the tax bill, the Dixon family’s gonna have to pay nearly $40,000 a year for health insurance with a $10,000 deductible. This boils down to having to pay $50,000 a year before your health insurance will kick in one red cent because of that deductible. Forty grand premium, 10,000 deductible, 50 grand before you will be paid anything.